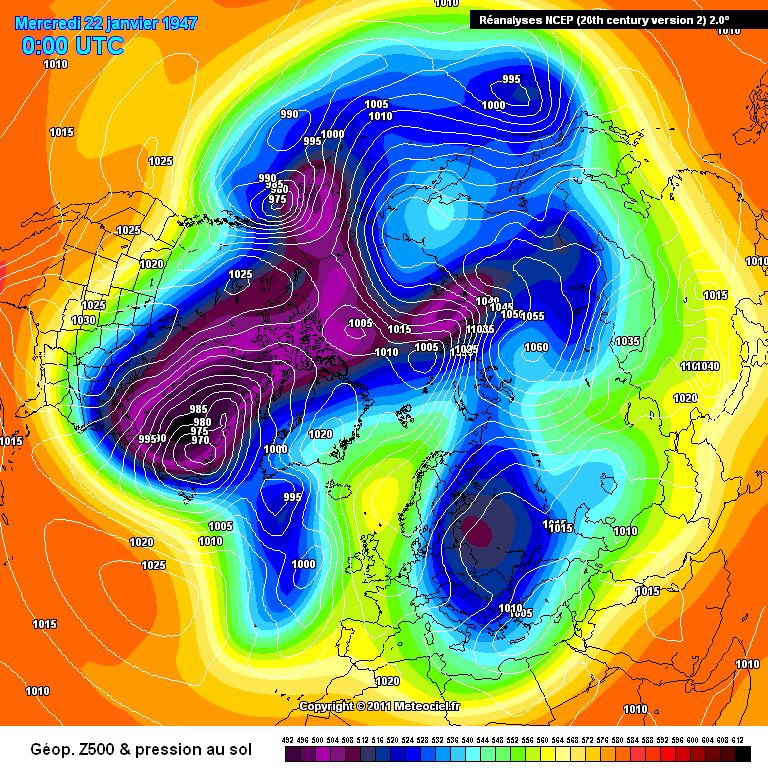 GEFS zonal wind chart with reversal today at 10 hPa 60 N.
Reverse showing also at 30 hPa at that point. With such an upheaval in the strat, plus the MJO seemingly favourable, we would very unlucky to miss out on a cold spell at some point over the next 6 weeks or so, in my view. 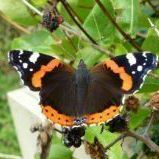 Not all SSW's produce cold spells in the UK - they increase the chances of blocking and colder weather. Not all SSW's are the same. This one appears to have been a 'displacement' type event followed by a split. 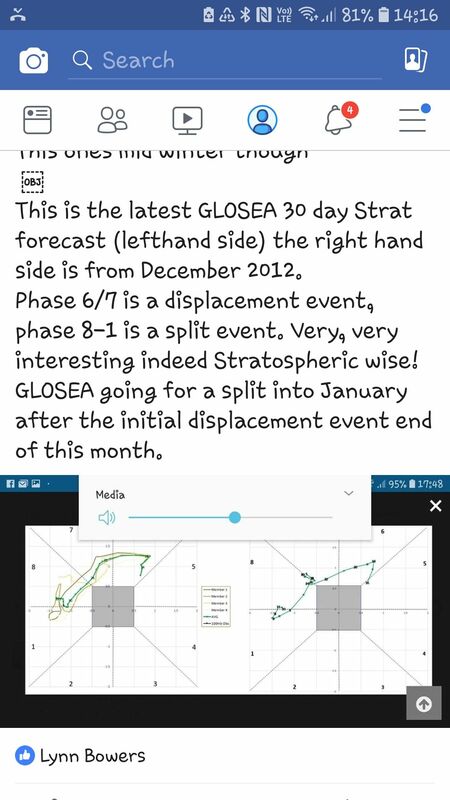 Stratospheric events do indeed take 2 to 3 weeks to completely impact the troposphere - if indeed they do...not all do. The current MJO is now expected to propagate into a strong phase 6/7 which would tend to encourage a negative NAO by late January. We've been in a moderate El Nino - which tends to produce milder first halves to winter in northwest Europe and 'colder' second halves. (This can be masked though by the general ongoing seasonal cooling which makes January/February colder than December anyway). This appears to have trended neutral recently. We're at the bottom of the decadal solar cycle where colder, more blocked winter tend to cluster. One slight fly in the ointment is that the QBO has shifted westerly from easterly (which favours blocking i.e. cold) but hopefully it's being damped out by the other strongly favourable signals. 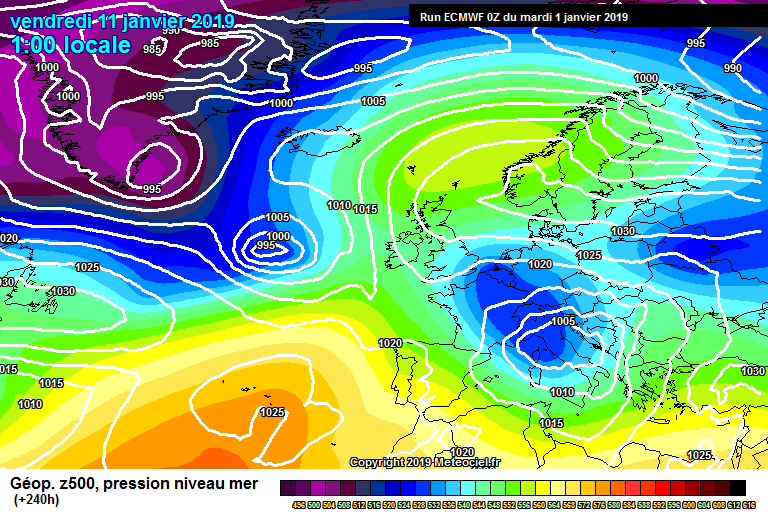 The strongest signal for easterlies from both GLOSEA and ECM has always been Mid January - February. 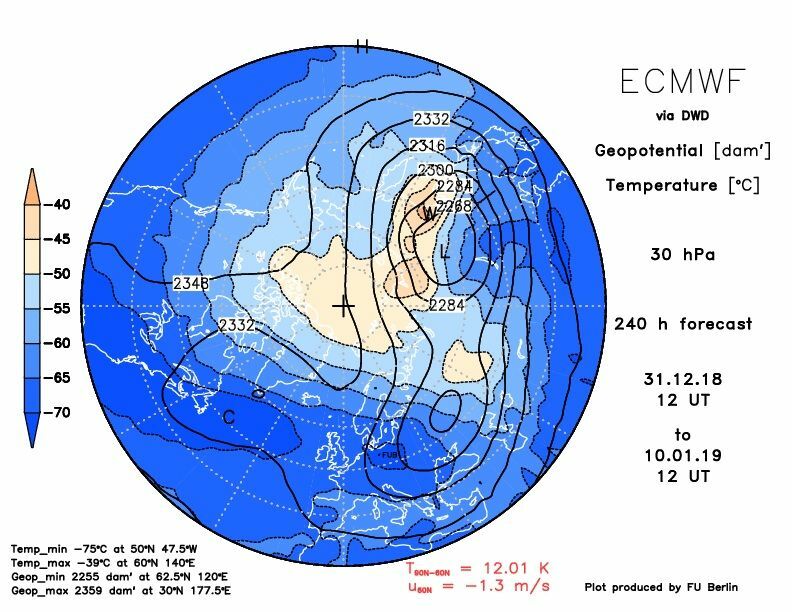 There are now tentative signs in the NWP of the disruptive effects of the SSW. So all to play for. As I understand it there is a lag time for effects to be felt with regard to a switch in the QBO? Is the MJO going to be the main driver as opposed to the SSW? Still on target this morning acc to Exeter.. There is indeed but this is quite variable maybe 30-40 days and also dependent on the level in the atmosphere and also varies in degree. SSW's are found rather more likely to occur more during easterly QBO phases. Each phase lasts approx 28 months. What impact does this have on the UK? We normally expect our weather to come in from the west - with a flow of relatively mild air coming in off the Atlantic. When an SSW brings easterly winds this tends to alter our weather patterns slightly, weakening areas of low pressure and moving our jet stream further south. This leads to high pressure over the North Atlantic, 'blocking' that flow of mild Atlantic air and dragging in cold air from the continent to the east. Exactly how cold it might be depends on the details of where the air comes from. SSWs don't always result in this outcome - but a cold snap follows more often than not, so the SSW greatly increases the risk of wintry weather. 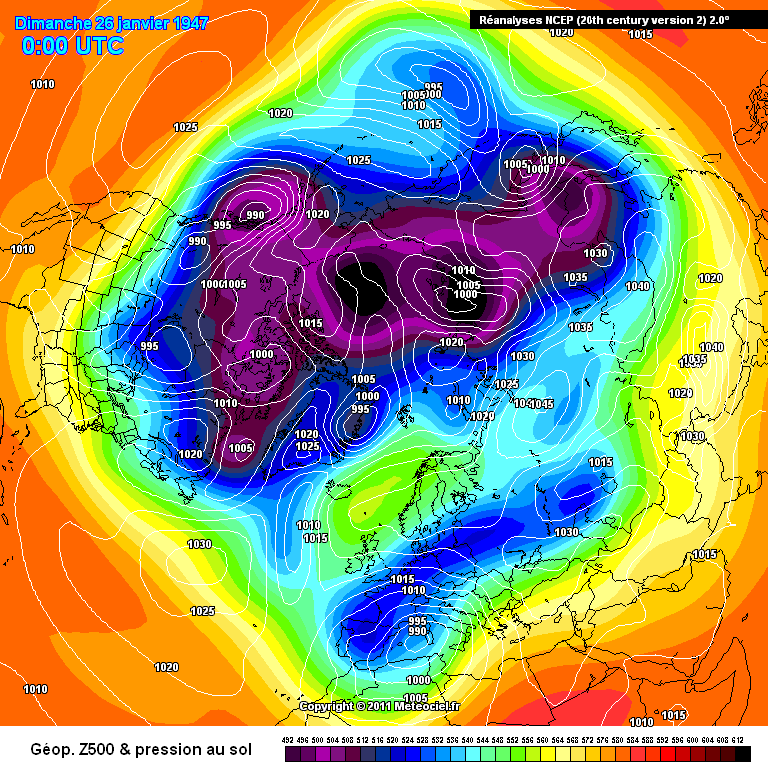 I wonder how much Exeter’s jan cold punt was predicated on the MJO and how much on the SSW ???? 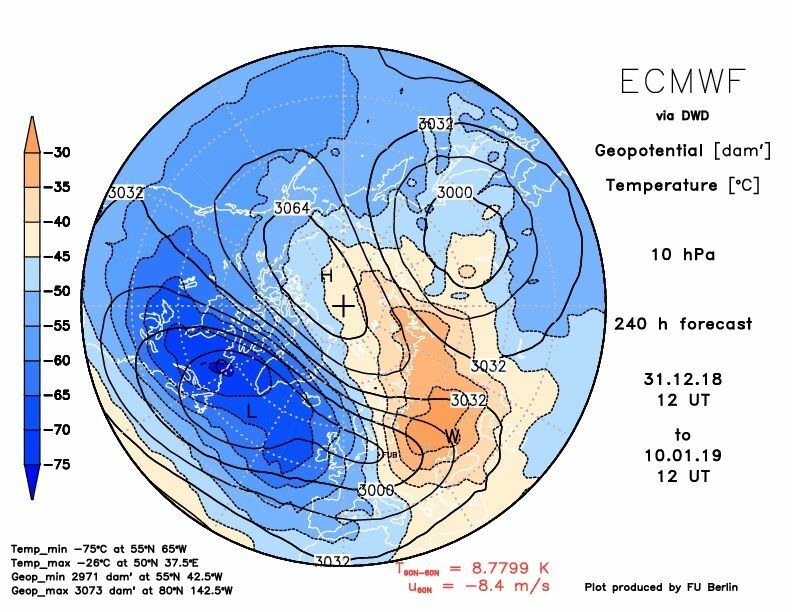 ECM good this morning - ties in with the 150hpa strat chart which suggests the Siberian lobe of split vortex may be held back further east allowing at least a temporary surge of scandy heights - greeny still the likely direction of travel? Upgrade charts coming inside the horizon. Honey pot visible. Potential longevity of what is coming possibly pleasing ('twas the only negative about the March Beast). HNY to all on here! Isn’t it a split we’re seeing though? Not a displacement. I put it in here cos it affects the hunt for cold. According to the bbc posted above,2 out of 3 SSWs result in cold for UK.. I'm certainly feeling a lot more positive today, signs that the times are a changing as we enter 2019. 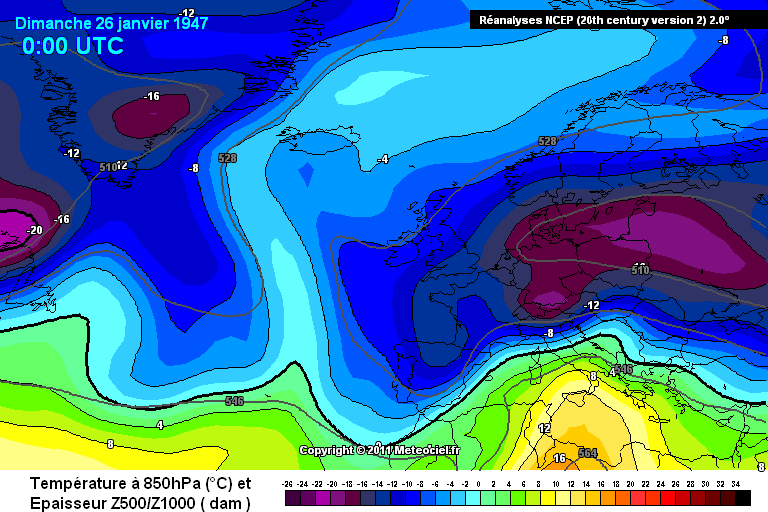 At the end of the day, I'd be happy with just 2 or 3 days of cold with some snowfall, it's not as if I'm being greedy. But none the less a late Jan 1947 repeat is long, long over due. This is how it developed, some similarities there in the 1st two charts to what we have showing now, from nothing to super cold, and the cold and snow continued well into February 1947. 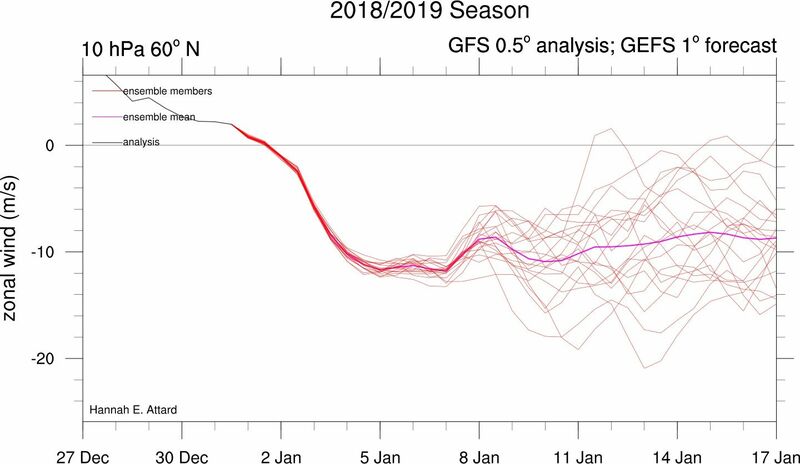 Either way now, it looks like hopefully my fears about the split not being wide enough or long lasting enough could be over, last good few GFS ops have stonking cross polar ridging in the strat with slow signs of downwelling, and its getting near to the reliable as well. Think i will go along with the pros for now..
Not sure what the long-term prospects hold because I haven't been following every update but the short-term appears to have the cold upped a notch. 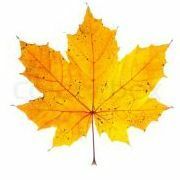 Media forecasts showing Maximum temperatures of 3c or 4c even down south in the big cities, come, the end of the week. Not far removed from my expectations here I think, with a colder scenario slowly developing and snow in the mix by week two or three? A quick paintjob to explain the trigger shortwave. In the day 6 , that's circled red , the main upstream low in black. The reason you must have low shortwave separation is the ridge extension from the limpet high needs an escape route. If those phase energy gets pulled over the top and you'd need a huge amount of upstream amplification to overcome that after that point. 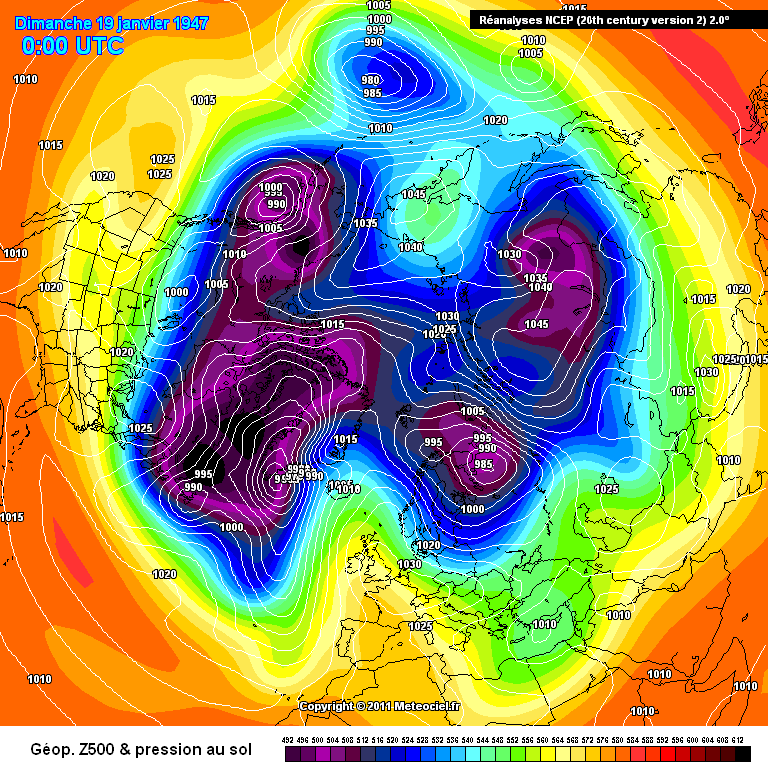 This ridge amplifies in response to the more amplified low. You can see the change between day 6 and 7. The shape of the low moves from the round football shape to more oval and the overall troughing elongates. As this happens the ridge is forced north ahead of that. At the moment the models are having problems forecasting the movement of shortwave energy in the Atlantic. This makes any forecast more difficult because the phasing or not with the upstream trough and shortwave energy impacts hugely downstream. That chart is the holy grail in terns of perfectly aligned WAA, hence the end result of the run. 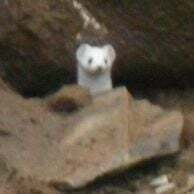 I think that relates to SSWs that create a split vortex rather than a displacement. The second type I'm pretty sure has a much lower 'success' rate. Yes , this type of evolution we’ve seen many times , high edges north shortwave heads se . We’ve also seen it fail many times aswell ! I’d prefer more distance with the upstream trough and trigger shortwave to increase the margin of error . 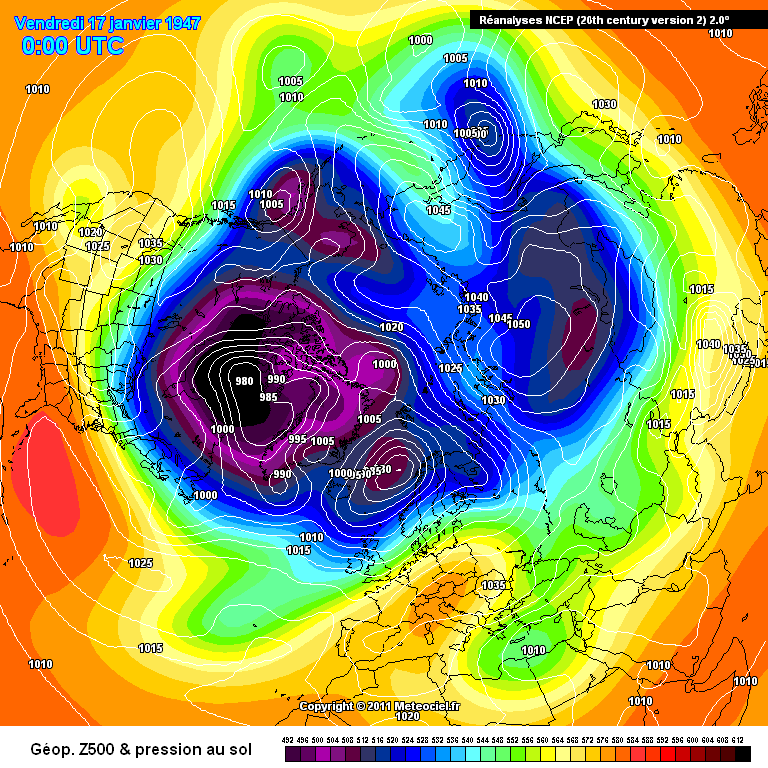 The UKMO is an example of what happens if they phase , no chance of evolving like the ECM .